Stop Bullying Now! Creating Caring Cultures. Giving Children Hope. The Bully Buster Handbook is a comprehensive resource. It provides answers to why kids bully, why others are bullied, and how to stop the cycles of violence. It is filled with suggestions on how to start an anti –bullying campaign and create a peer coaching program where kids unite to help younger kids. The book offers practical suggestions on what works and what doesn’t. It also builds resilience and empowers those targeted by challenging beliefs to change their emotions and mental software. It includes tips from Inspired Discipline, my training program for teachers, as well as guidelines from Conscious Choice, the program for students. The revolutionary model: The Power of Positive Action will help you involve the entire community to create a caring culture. 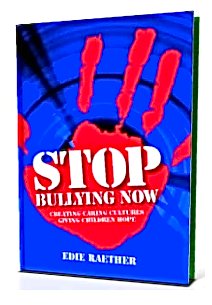 ORDER YOUR COPY of Stop Bullying Now! Creating Caring Cultures. Giving Children Hope. Order now to get the prepublication price of $14.95 and save 25%. Special Bonus: Get the eBook ($9.95 value) FREE. Stop Bullying Now! the E- Book. 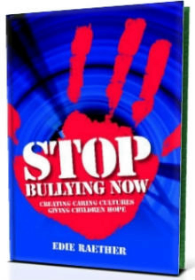 Get the eBook ($7.77 value) FREE if you order Stop Bullying Now! Creating Caring Cultures. Giving Children Hope. Special Bonus: Order now and get the eBook ($9.95 value) FREE!.